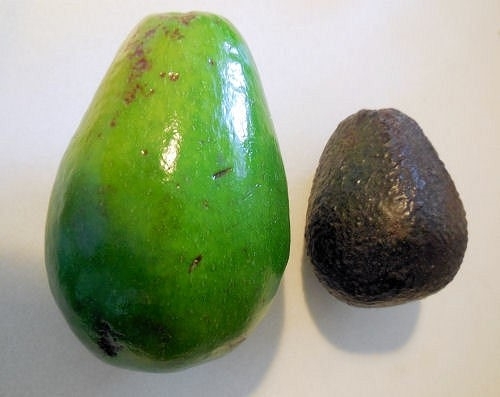 Avocado harvest time and the growers are in the orchard checking things out a little more closely and to see what is going into the bins…..and they see some unusual shaped fruit. Here's what's been popping up and some possible explanations. Crick-side - First described by Dr. J. Eliot Coit as kink-neck and later by Horne (1931) as kink-side. Finally, the name crick-side (Horne, 1934) was adopted. It is characterized by a definite depression on one side between the stem end and the larger portion of the fruit causing a distortion. In some cases, the area of depression turns black and the fruit drops. 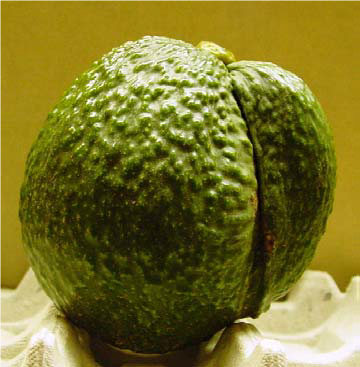 In other cases, the fruit grows and matures but the distortion remains. Crick-side is usually found on trees carrying a heavy load of fruit. It has been suggested that high temperatures or temporary water-stress may relate to the occurrence of crick-side, but no definite determination as to its cause has been made. 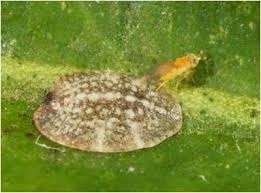 Carapace Spot - First described by Horne (1929), the name carapace-spot was chosen because of the resemblance to a turtles' back. This external blemish is corky and usually cracked into somewhat regular, angular divisions. The flesh under the carapace spot is undamaged, but exterior appearance is such that the fruit is reduced in grade. 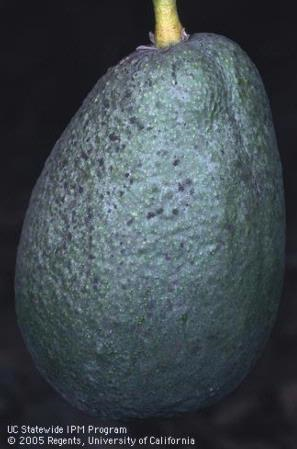 Slight rubbing or brushing of tender young fruit on leaves or stems appears to cause this corky growth to start. 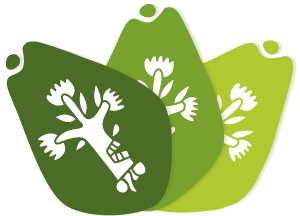 Fruit on trees exposed to strong winds are more apt to develop the trouble. Windbreaks should reduce injury in windy areas. 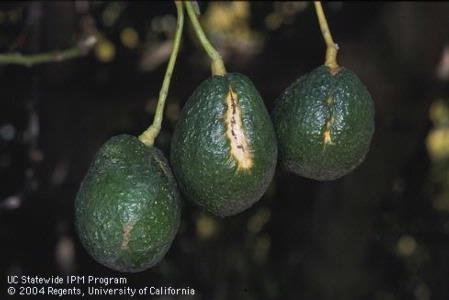 Photo: Avocado thrips damage, carapace damage and greenhouse thrips damage. 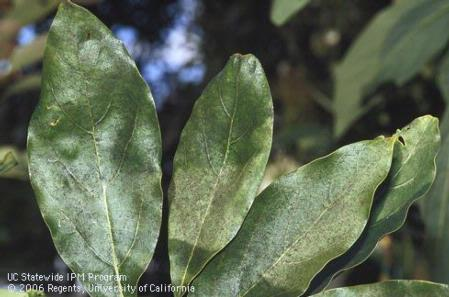 Sunblotch - This is a viroid that can affect fruit, leaves, and stems with a yellow or reddish streaking, cause a compacted growth and willowy growth habit. 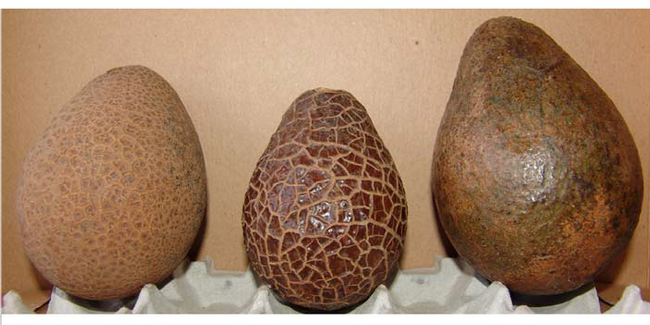 The streaking in the fruit is usually depressed and doesn't extend the length of the body. 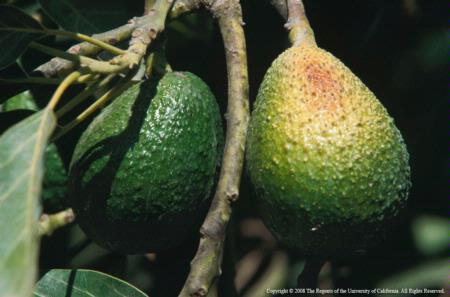 Sunburn - Fruit exposed to full sun may be injured by sunburn. 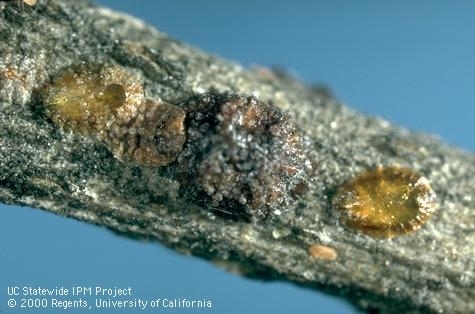 This occurs when trees defoliate, or partially defoliate, from any of several causes, leaving the fruit exposed. 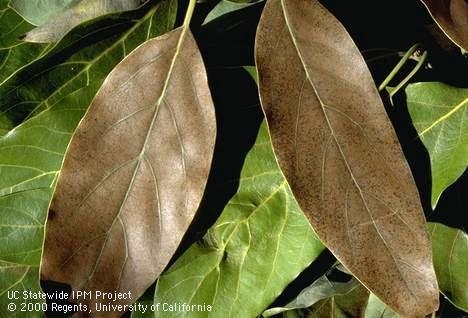 It is normally most severe on fruit on the south and southwest portion of the tree. 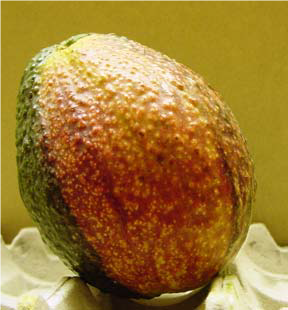 Sunburn shows as a pale yellowish area on the exposed side of the fruit. 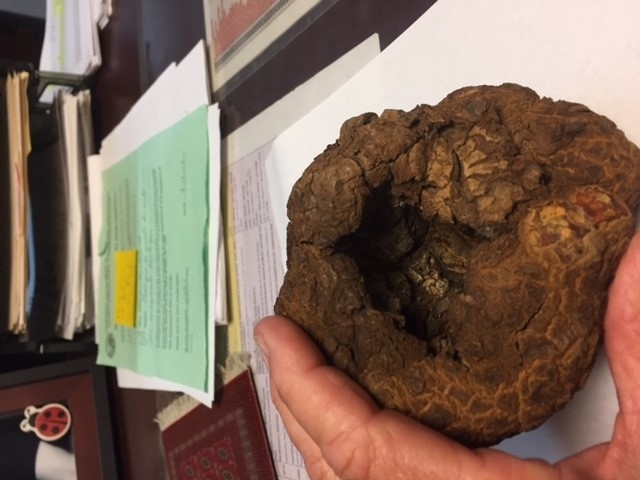 Often the center of this area turns brown to black and may wither. Ring Neck - This trouble has been observed occasionally, particularly with Hass. The cause is unknown but is believed to be related to soil-plant water deficiency at a critical time. 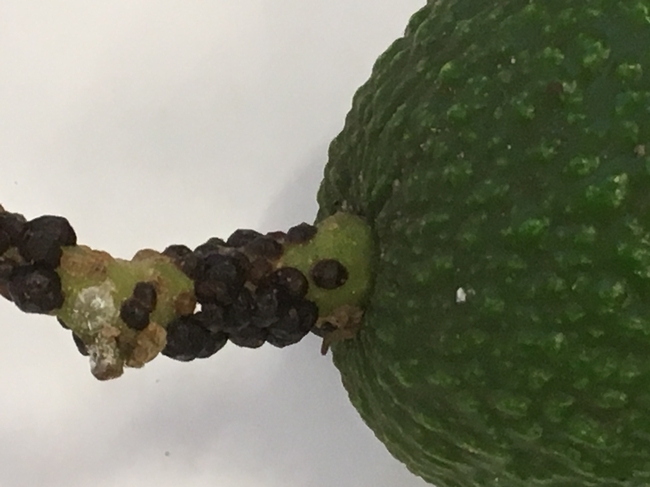 A ring of tissue on the pedicel just above the attachment to the fruit dies, turns black and peels off. If only superficial, the fruit remains on the tree. 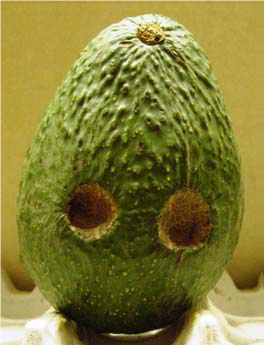 Growth may be retarded because the restriction impedes movement of nutrients and water outward to the fruit. Most severe in humid coastal areas. Embossment - Occasionally, and particularly on Fuertes, a section of the surface will be raised slightly or be a darker or lighter color. This is referred to as a sectional chimera or genetic mutation. Cuke - As in cucumber but not a squash. These are seedless fruit that can most often be seen from a fruit set in cooler weather or due to some hormonal stimulus. We don't know the reason, but seems to occur more commonly along the coast. 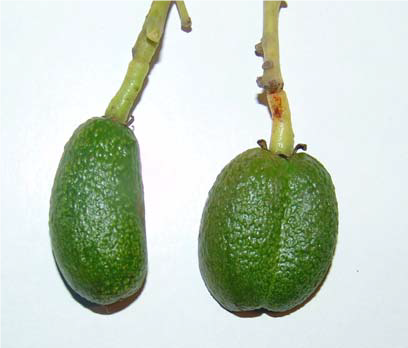 Double Fruit - In some instances there may be a normal shaped fruit with a single cuke attached ot in some cases there is a double ovary and two fruit are attached. 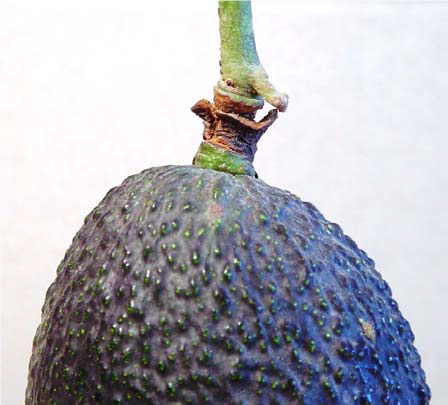 Woody Avocados - For some unknown reason, avocado fruit will form into a grotesque woody structure hardly resembling an avocado. The cause is genetic and non-transmissible. Sources: R.G. 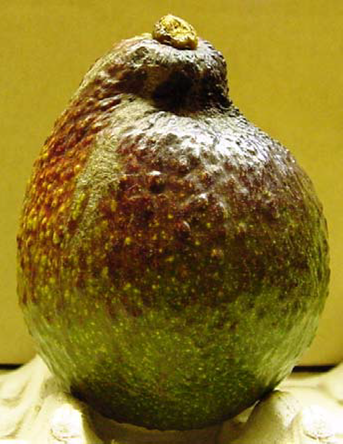 Platt - California Avocado Society Yearbook 1972-73 and Reuben Hofshi and M.L. Arpaia Yearbook 2002.